It’s no secret by now that my family loves pancakes, and I’ve already shared our favorite pancake recipe on this blog. But millions of people worldwide either can’t, or choose not to, enjoy traditional pancakes because of the wheat flour that’s used in the recipe. 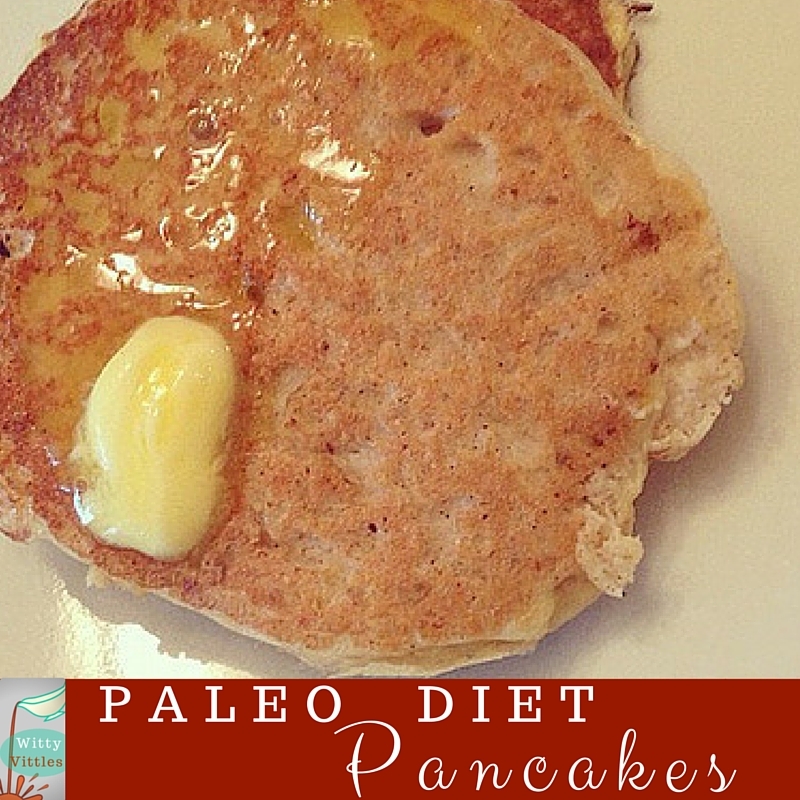 That’s why, on this National Pancake Day, I decided to feature some paleo diet pancake recipes that are completely (or almost completely) gluten free. You can take my old-fashioned pancake recipe (linked above) and substitute almond flour for the regular flour, almond milk for the regular milk, honey for the white sugar, ghee for the melted butter, and 3/4 teaspoon baking soda combined with 5.5 teaspoons of lemon juice or vinegar for the baking powder. Alternatively, you can try this recipe from Elana Amsterdam, the author of The Gluten-Free Almond Flour Cookbook, which I’ve mentioned in a previous post. In a food processor or blender (I like the Ninja Master Prep), chop up the almonds into tiny pieces. Add the almond milk, baking soda, eggs, banana slices, and the vanilla extract. Pulse together until smooth, about one minute. Stir in the chocolate chips just before cooking the pancakes. Melt the coconut oil in a skillet over medium high heat. Spoon batter into the skillet, and cook each pancake for about 30 to 60 seconds per side. I love sweet potatoes…and, of course, I love pancakes. This combination is almost unbeatable! Whisk together the first five ingredients. In a separate medium-sized bowl, stir together the flour, nutmeg, and cinnamon. Pour the wet ingredients into the dry ingredient bowl and stir together until thoroughly combined. Heat the coconut oil in a skillet until melted. Spoon about two tablespoons of the pancake batter into the skillet and pat down to flatten into a pancake form. Cook over medium high heat for two to three minutes. Flip the pancake over and pat it down again to flatten even more and free some of the uncooked batter. Cook on this side for about two minutes. Flip the pancake again and cook for an additional 30 seconds. ‘Tis the season to make pumpkin EVERYTHING! Yay! We love pumpkin at our house, so combining pumpkin flavor with our favorite breakfast pancakes is a no-brainer. Turns out, it can make a fabulous paleo breakfast treat, as well. Here’s an all-paleo pumpkin pancake recipe that’s sure to please everyone in your household. Whisk together the eggs, pumpkin, almond flour, vanilla, and honey. Stir in the baking soda, cinnamon, ginger, cloves, nutmeg, and salt. Melt the coconut oil or ghee in a large skillet over medium high heat. Pour most of the melted oil or ghee into the pancake batter, reserving some to grease the pan. Spoon batter into the skillet and cook each pancake for about 30-60 seconds per side. I’m not so married to my old family favorites that I won’t change it up every now and then and cook something different. My daughter just convinced her daddy to buy a couple of pumpkins for her and her sister the other day, so I used the pumpkin inside to whip up some pumpkin pancakes with this recipe. Note: if you use fresh pumpkin instead of canned, you might have to add more flour to the batter (maybe a couple of tablespoons more) to make it thick enough. These recipes just prove that you can still enjoy pancakes for breakfast, even if you can’t eat flour. So, why not whip up some today and indulge?